During the commercial development of the North Rankin A offshore production platform in Western Australia in 1980, problems arose when Woodside Petroleum’s engineers discovered that the steel piles which attach the platform to the sea floor had not developed sufficient bonding to the surrounding sediments. Thus the platform’s foundation capacity may not be able to resist cyclic loading from cyclone-generated surface waves and the platform’s insurance certification and safety conditions during cyclone events were not satisfied. Something had to be done to solve this problem. Research led by Graham Price, CSIRO Division of Geomechanics, helped to solve the problem through the development of an in-depth understanding of the behaviour of sub-seafloor carbonate sediments when they are disturbed and subjected to loads such as those from the foundations of large oil and gas platforms. In recognition of his contributions to resolution of foundation problems for the oil and gas platforms on the NW Shelf of Australia, Graham Price was awarded the 1990 Sir Ian McLennan Achievement for Industry Award. As a result of these studies Graham understood the critical requirement for a reasonable level of carbonate cement between the shell fragments in the sediments and set about investigating the various forms of natural mineral cements that exist in rocks. 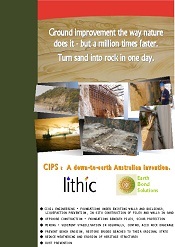 This led to the development of a permeation grouting system to deliver calcite cement into porous sediments, called CIPS (Calcite In situ Precipitation System) and the formation of the private company Lithic Australia Pty Ltd [external link] to commercialise CIPS through an exclusive license from CSIRO. The range of applications for CIPS is being extended to in situ construction of columns and walls, coastal protection, restoration of eroded beaches, prevention of liquefaction in areas prone to earthquakes, the management and control of subsurface water to prevent acid rock drainage and the preservation of stone in historic and artistic sites and artifacts. The research originally arose following the emplacement of the North Rankin A gas platform on the North West Shelf by Woodside Petroleum Ltd. The platform’s production facilities sat on a conventional 8-legged steel jacket that rose from the seafloor 125 m below the water surface to 28 m above the water level ‘ designed so that waves up to 27 m high generated by cyclones that frequently strike the area could pass safely below the production facilities. The platform’s jacket was secured to the seafloor by 32 steel piles attached to the legs, each pile an open-ended steel pipe, 2 m in diameter and 125 m long, which was driven into position by hammering. The design foundation capacity (its ability to withstand forces from cyclone-generated surface waves) would be provided by skin friction between the walls of the piles and the surrounding sub-seafloor sediments. However, during emplacement of the piles it soon became clear to Woodside’s engineers that the anticipated level of skin friction between the piles and surrounding sediment had not developed and consequently the total foundation capacity had not reached the required level. This lack of foundation capacity meant that the platform’s insurance certification and safety conditions for periods when cyclones came close had not been satisfied and that workers would need to be evacuated at such times. Since evacuation was not acceptable, something had to be done to correct the problem and restore foundation strength. In response to this situation, Woodside engaged consultants and researchers around the world and began a program of sediment sampling and laboratory testing to try to understand what had happened and to develop a strategy to rectify the problem. Graham’s role, which began in 1984, was to examine the fabrics (composition, internal structure and texture) of undisturbed sediment samples and samples tested in civil engineering laboratories around the world and also to conduct specialised simple shear tests. The work mainly involved examination of petrographic thin sections of the sediments, identification of their composition and fabrics and interpretation of the processes that had occurred within the sediments in response to the deformation imposed by the laboratory tests. Graham’s task was to explain the complex mechanical behaviour of the different sediments ‘ behaviours that had not previously been encountered in the largely clastic and clay-rich sediments that characterise other offshore oil and gas provinces around the world. the abundance of faecal pellets from worms that lived in the sediment just beneath the seafloor and which cause extensive sediment bioturbation. These pellets were extremely soft and when disturbed they instantly dispersed into a mixture of very fine carbonate grains and water ‘ effectively a very soft mud. the presence of a varying degrees of carbonate cementation between shell grains in the sediments. In those layers where there was no cementation, grains could easily move about and repack into denser arrangements when the sediment was compressed (an inelastic response) so they only developed significant resistance (strength) after much deformation. In other layers a small amount of cement between grains caused an early brittle, but ultimately weak, mechanical response followed by collapse and grain repacking at large deformations. In a few layers a moderate amount of cement between grains caused an early elastic response with resistance building to a moderate level before failure and collapse to a more densely-packed sediment. Many of the shell grains had thin walls and large internal cavities and when squeezed by other more solid shells they readily disintegrated into mixtures of small particles and water. The outcome of Graham’s work was a behaviour model that described the processes that caused deformation in the sediment and explained the sediment’s different stress-strain responses. Of particular importance was the recognition that when the sediments were subjected to shear deformation, as occurred along the margins of the driven piles, then distinct shear zones would develop along those margins in which shell grains readily fragmented and mixed with disintegrated faecal pellets to form a water-lubricated carbonate mud with virtually zero strength. Also, as each pile was driven into the sediment these shear zones propagated ahead of the advancing pile margins so that the pile itself never encountered the natural sediment and so almost no resistance developed ahead of the pile and no skin friction developed along the pile’s sides. That is, pile emplacement was lubricated with very fluid carbonate mud and this prevented the build up of foundation capacity. In contrast to this shear deformation, if sediment was subjected to a balanced load, as would occur under a flat plate, relatively few shell grains would fracture and predominantly the sediment would compress and densify, by the expulsion of water and the loss of open pore spaces between grains, until high strengths developed (high resistance to further deformation). Graham’s sediment deformation model allowed Woodside’s engineers to adopt a program of remedial work that involved changing the basis of the platform’s stability from skin friction along the sides of the piles to end-bearing compression at the ends of the piles. This meant drilling out the interiors of the piles (which had become filled with sediment during emplacement), excavating bell-shaped cavities out from the ends of the piles, emplacing steel reinforcement cages, then filling the cavity and pile interiors with concrete. This work was carried out successfully, the strength capacity of the foundations confirmed and insurance certification granted so the platform could continue to operate and remain safe during cyclones. Because of his extensive observations on the NW Shelf sediments and his understanding of what controlled their mechanical behaviour, Graham realised that the critical element was the presence or absence of a reasonable level of carbonate cement between the shell fragments in the sediments. If cementation was present then the sediments had strength and could withstand an applied engineering load, but if no cementation existed then the sediment was very weak and it would not resist an engineering load. He reasoned that if an artificial means could be developed to deliver carbonate cement into the sediment then its deformation response could be changed and made much stronger ‘ effectively the soft sediment would be transformed into strong rock. Graham set about investigating the various forms of natural mineral cements that exist in rocks with the aim of developing an artificial method of cementation. In nature geological processes cause cements to build up slowly inside sediments over many thousands or millions of years. The processes are slow because the relevant chemical reactions operate at close to equilibrium and involve the local dissolution of less-stable carbonate grains and carbonate cement deposition in more favourable sites. What was needed was an artificial method of producing the same natural mineral cements, but to do so quickly, in one day if possible. It was clear that such a method must be way-out of equilibrium so it would proceed quickly, yet it needed to remain controllable so that the cement could be delivered to precisely the areas were it was needed ‘ to the contact points were neighbouring grains meet. In 1988 Graham Price won an ARC research grant to employ a chemist and technical staff. In addition he continued to support the work by consulting on projects for various oil and gas companies. Over the next two years his group developed a permeation grouting system to deliver calcite cement into porous sediments, which they called CIPS (Calcite In situ Precipitation System). CIPS was a controllable means of injecting a water-based, non-toxic, neutral pH and non-particulate fluid into a porous material such as sand which would then undergo a chemical reaction and precipitate the mineral calcite (CaCO3). This calcite formed rinds of cement around the sand grains and where the grains came close enough it formed strong crystalline bridges that bound neighbouring grains together. A solid framework of cemented grains could be developed through the sand and this framework could be strengthened by subsequent retreatments with CIPS because the pore spaces between grains remained open. In this way any desired strength could be achieved, from a minimum of about 0.5 MPa up to around 50 MPa, which is the strength of high quality industrial concrete. Extensive laboratory evaluation of CIPS was carried out within CSIRO and by postgraduate students in the Department of Civil Engineering at The University of Western Australia. Small field trials were also conducted in Australia and in the UK. While still in CSIRO Graham formed the private company Lithic Australia Pty Ltd to commercialise CIPS through an exclusive license from CSIRO. Early work concentrated on investigating the fundamentals of CIPS chemistry, securing a long-term supply of key chemical ingredients and the development of manufacturing methods and injection grouting systems for different applications. Graham left CSIRO in 2002 to concentrate on the commercialisation of CIPS and since then licensing agreements have been set in place for its commercialisation within Australia and overseas. This commercialisation work continues and the range of applications for CIPS is being extended. CIPS is being applied to civil engineering projects involving the stabilisation of excavations in sand and the remedial treatment of foundations for walls and houses. It has potential application in offshore engineering (stronger and shorter piles, prevention of scouring around structures), in situ construction of columns and walls, coastal protection, restoration of eroded beaches, prevention of liquefaction in areas prone to earthquakes, the management and control of subsurface water to prevent acid rock drainage and the preservation of stone in historic and artistic sites and artifacts.